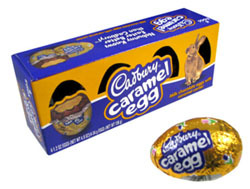 Just when you thought it was safe to eat candy… The Chinese milk contamination that has made over 50,000 babies ill has prompted Cadbury to begin pulling eleven of their products, including their popular creme eggs, from US store shelves. The culprit seems to be melamine, a hazardous chemical used in plastics and fertilizer. Some of the experts say that the melamine may have transferred naturally during food processing, but there is strong evidence that corrupt milk suppliers are to blame. Apparently, they have been boosting their output by diluting their milk with melamine because its nitrogen content can fool tests that verify milk’s protein content. Testing that’s been done shows a “safe” level of melamine in the Cadbury Eggs, but they still pulled them from shelves just to be sure. Realistically, the next Cadbury Creme Egg that you eat will not kill you… unless you choke on it… but, if the company wants to pull them off the shelves, you might just want to toss out those potentially bad eggs.